Who is welcome to receive Holy Communion? Are all invited to receive the sacrament? All baptized Christians? Or, all baptized Christians who believe that Christ is truly present in the sacrament? Variations on these three invitations can be found printed in worship bulletins across our church. 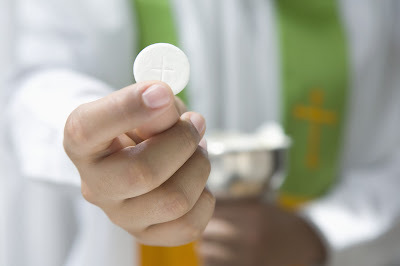 The longstanding understanding of the church is that communion is for the baptized, a teaching that is upheld in The Use of the Means of Grace: A Statement on The Practice of Word and Sacrament, adopted by the Evangelical Lutheran Church in America in 1997. Voting members at the Churchwide Assembly of the Evangelical Lutheran Church in America last week asked our church to review our communion practices (scroll down, see third bullet point near bottom of article), considering the variety of practices at work in our congregations regarding sharing the sacrament with people who are not baptized. This blogpost is a first reflection on this topic, and I look forward to conversations on the blogosphere and through the church’s process of discernment and study on this matter. Our church teaches that Holy Communion is the body and blood of Christ, a sacrament that nurtures the gift of faith. The Lord’s Supper is given as a daily food and sustenance so that our faith may be refreshed and strengthened and that it may not succumb in the struggle but become stronger and stronger. Large Catechism, The Sacrament of the Altar, 467:8; 469:24 The Book of Concord: The Confessions of the Evangelical Lutheran Church, trans. Kolb/Wengert. Those who have faith, and seek to have it strengthened by this sacrament, are presumed to be baptized Christians. Indeed, the pattern in the history of the Christian Church is that first a person is baptized into Christ Jesus, into his death and resurrection, and made part of the Body of Christ. Then, that person receives the sacrament of Holy Communion to nurture them in their life of faith. Whoever, therefore, eats the bread or drinks the cup of the Lord in an unworthy manner will be answerable for the body and blood of the Lord. Examine yourselves, and only then eat of the bread and drink of the cup. For all who eat and drink without discerning the body, eat and drink judgment against themselves. This passage has long been interpreted as a call to self examination, hence the preparatory rites of confession and absolution many churches have prior to celebration of the sacrament. One who is unrepentant, or unbaptized, would receive the sacrament in an unworthy way. In considering preparation for Holy Communion many people in our congregations have turned for counsel to Paul’s admonition to the Corinthians : “Examine yourselves, and only then eat of the bread and drink of the cup . For all who eat and drink without discerning the body eat and drink judgment against themselves.” Paul’s words are addressed to those in the community who are eating and drinking while excluding from the meal others who belong to Christ. “Do you show contempt for the church of God,” he says, ” and humiliate those who have nothing? ” The body that Christians need to discern is the body of Christ which is the Church and that is the body which is being ignored by the exclusions in Corinth. The “unworthy manner” of 1 Corinthians 11:27 refers more to the exclusionary, divisive, and unjust practices of the Christian community itself than to an individual’s moral or spiritual unworthiness, and “discerning the body” refers to discerning the health and faithfulness of the Christian community. The judgment we have feared would fall upon one receiving the sacrament in an unworthy fashion is not a judgment dolled out to one who received the sacrament in an unworthy manner, but a judgment dolled out on a community that fails to regard and live into the justice, grace, and unity the sacrament promises. Furthermore, too much attention given to any “worthiness” we may achieve or receive through confession of sins or proper profession of faith risks turning admission to the sacrament an accomplishment achieved through faithfulness rather than a gift offered through our Lord’s invitation. If we truly believe this sacrament to be a spiritual food of our Lord’s presence, such food can benefit all who believe it whether we are on the road to baptism or living a baptized life, whether we are in the midst of unrepentant sin or in living as a penitent. Indeed, an encounter with Christ who gives himself “for you” is precisely the Gospel word of love and welcome that renews the sinner and leads him into a new life of repentance and care for neighbor. With 1 Corinthians 11 off the table as a prohibition for the unworthy and unbaptized to receive the sacrament, I struggle to see why we would maintain the prohibition. Let the unworthy and unbaptized who desire to receive our Lord’s body and blood come! There is no need for a rigid sacramental sequence that must start with baptism. Such a sequence might be the norm, but it need not be the only pattern of sacramental participation. “If we allow the unbaptized to receive communion,” some say, “we reduce the value of baptism itself.” I don’t buy it. If we believe that Christ is truly present in the sacrament – if we believe that in the sacred meal of Holy Communion we truly encounter our risen Lord – then who are we to prohibit from receiving the sacrament anyone who desires to receive the flesh and blood of Jesus? Is not his cup “shed for you and for all people“? I do not support willy-nilly “communion without baptism” as a standing policy. It makes no sense to invite those who do not believe or do not seek the Lord. Furthermore, it is even worse to coerce anyone to receive the sacrament through peer pressure or an expectation that everyone who attends a church service must fully participate in every part of that service. But, I do support a careful and inviting practice of sharing communion before baptism, for any who feel called to receive our Lord’s body and blood. Such a practice of welcoming to the altar any who desire to receive the sacrament, regardless of baptismal status, acknowledges that there are people who may show up at our churches who are seeking Christ and the benefits of his real presence who are not yet baptized. These are people who should not be denied the opportunity to receive our Lord’s body and blood on account of their baptismal status. The church should trust their desire, rooted in faith, and welcome those with such a desire to share in this sacred communion meal. Such a practice of welcome for any who desire to receive would be surrounded by regular and robust teaching and reflection on the sacraments in the life of faith and of the church, and take place within a process of catechesis and formation that intends to lead to baptism. Such a limited, intentional practice of welcome to the altar reflects our Lord’s own words of welcome and maintains a high regard for the sacrament, trusting that God will work through our Lord’s real presence in Holy Communion to nurture faith … even the budding faith of the unbaptized who desire to receive our Lord. I look forward to our church’s conversations, study, and discernment on this matter. This entry was posted in Faith & the Church, Liturgy, Lutheran and tagged Book of Concord, communion before baptism, Communion without baptism, ELCA, Evangelical Lutheran Church in America, liturgy, lutheran, sacraments, Use of the Means of Grace. Bookmark the permalink. Chris, you always raise such thoughtful conversations. There is so much behind this, especially when so many have been raised in different faith traditions and carry so many assumptions. I was raised Roman Catholic yet when I began attending Lutheran church there was no question that I was welcome to the table (though this was when the green book was just being introduced and folks were a little confused that a Catholic boy knew the new liturgy better than those raised on the black book. Let’s hear it for Vatican II). To this day my mother will not take communion with my father (Reformed/UCC) or with us (though when dad joined us at our church to sing in the choir one Easter since his previous choir director was leading he choir he had no problem joining us at the altar). And since she only goes to a Catholic Church for funerals and has not gone to confession, she doesn’t commune there either. Especially when the priest reminds the congregation that only Catholics are welcome. We are blessed and humbled by this gift from God through Jesus, and just as God’s grace is given freely to all, I think of communion in the same way. I was the author of the resolution that memorialized the ELCA to take up the question of Baptism as the prerequisite for Communion. Today I blogged about my experience. I was gratified to have the Committee’s recommendations adopted. I look forward to the conversation that will result from it. And I am pleased that you have added your voice to this conversation. Thanks, Brant, for posting here. I appreciate learning the history of this memorial, and look forward to what will come of it.